The third edition of this trusted resource for veterinary nurses retains the popular format that has been so successful in establishing the previous editions. All the principal procedures a nurse is likely to be called on to perform are presented in the most practically useful way, linking the action with the underlying rationale and illustrating both with ultra-clear line artworks and photographs, now in full colour and with additional figures for this edition. 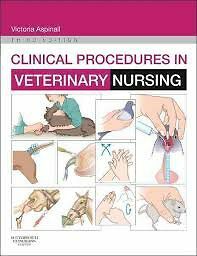 New material includes coverage of minor surgical procedures while recent changes in the veterinary nursing syllabus are reflected in sections on the horse. Along with these and other changes, the new Clinical Procedures in Veterinary Nursing has been updated throughout to guarantee its continuing role as the veterinary nurses best friend in practice.